This review contains mild spoilers! 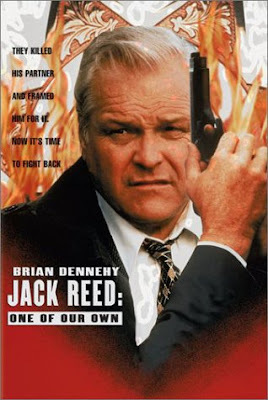 "Jack Reed: One Of Our Own" is an entertaining mystery, but too short. Brian Dennehy plays the title character. His partner is killed and he's looking for the killers. He realizes that the criminals are not just killing for fun, but ordered to by someone in politics. Can Jack figure it out? Brian Dennehy also directs this film and does a good job. His performance as usual is on target. Charles S. Dutton basically stands around. The only problem I had with the film is that it's too short. Don't be fooled by the two-hour runtime, It's only 85 minutes. If you like Brian Dennehy, you'll bound to enjoy these films: Rising Son (1990), Deadly Matrimony (1992), and Teamster Boss (1992).